There is a bed. 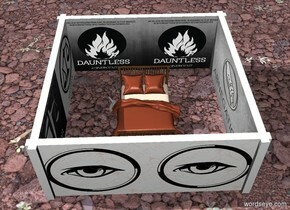 There is a [dauntless] wall 5 feet behind the bed. There is a [abnegation] wall 5 feet to the right of the bed. the [abnegation] wall is facing the bed. There is a [candor] wall 5 feet to the left of the bed. The [candor] wall is facing the bed. There is a [erudite] wall 5 feet in front of the bed. The [erudite] wall is facing the bed.